Pax Earth, under the project “Mission Education and Environment”, has been contributing in improving the education and environment of poor and underprivileged children in rural Nepal for the last three and half years. 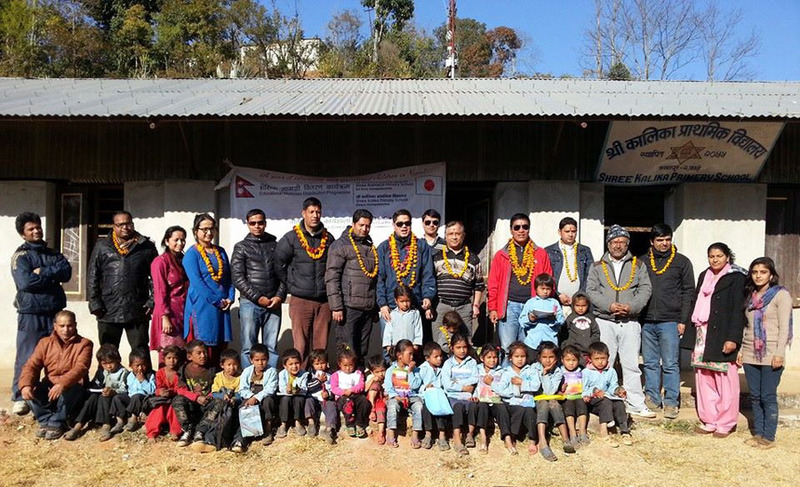 According to the plan, a 23-member jumbo Pax Earth team led by Pax Earth Nepal President Sujan Koirala traveled to Kavrepalanchok and organised an environmental workshop and distributed hygienic materials to the poor and underprivileged students of Shree Seti Devi Primary School on December 24, 2013. On the same day, they distributed educational materials to the poor and underprivileged students of Shree Kalika Primary School and Shree Raktakali Primary School of Kanpur VDC of Kavrepalanchok. 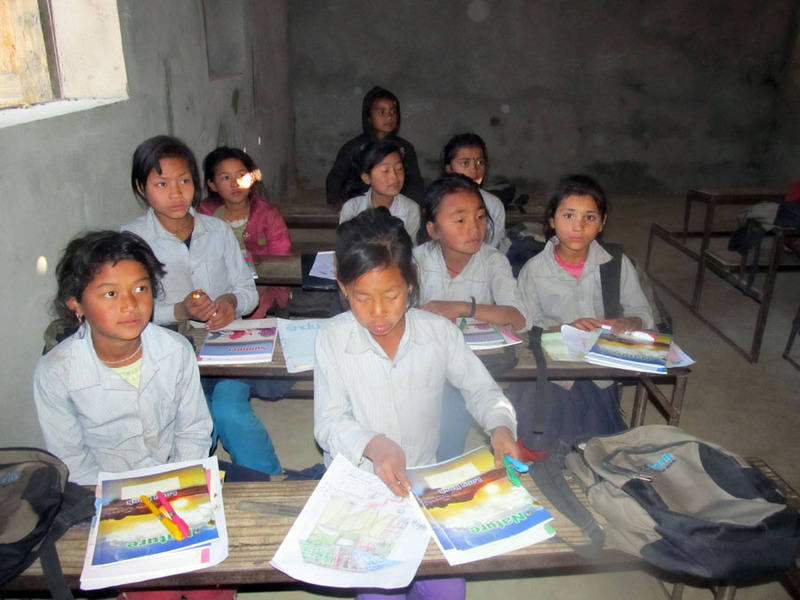 Pax Earth went to Shree Seti Devi Primary School with a program for the first time. Pax Earth had a field survey of this school in September 2013 before deciding on adding this school to the mission. More than 215 students benefited with the environment workshop, educational materials and hygienic materials distribution in three schools in Kavre. In addition, the Pax Earth organised a villagers gathering on the next day. It was organised to discuss on the problems and prospects in the village. A full report of the whole program is presented below. On December 24 at 7:30 morning, members, special guests and well-wishers started to assemble at PEN Secretariat, Pashupati Kathmandu. After having a cup of tea and loading the educational and hygienic materials, a 23-member team led by President Sujan Koirala along with Special Guests Rabindra Man Joshi, Ngima Dorji Sherpa, and Upendra Badal; Guests Rajani Poudyal, Niranjan Acharya and Lava Dhakal; Well-wishers Akira Sahukhal, Suraj Acharya, Dina Nath Ray, Rupa Mainali; and Members Binod P. Mainali, Bal Gopal Shrestha, Kapil Koirala, Laxman B. Pahari, Sovanand Yadav, Debraj Ghimire, Kamala Basnet, Bhagabati Pandey, Manohar Sapkota, Kapil Deuja, Ram Sharan Paudel and Harihar Sapkota headed for project sites in Kavrepalanchok in a micro van, two jeeps and two motorbikes at 8:00am. The team stopped for the lunch at Dhulikhel. The entire distribution team was divided into 9 sub-teams (each consisting of two members) for effectively carrying out the distributions and the workshop. President Koirala briefly explained the role and responsibility of each team and the activities to be done in the schools. 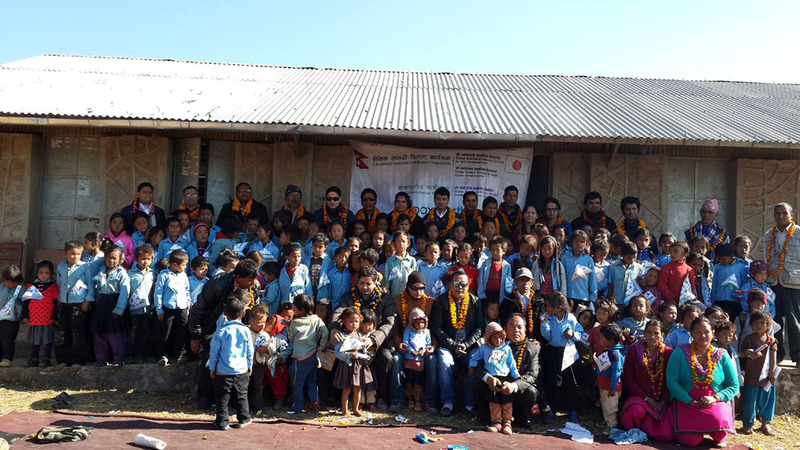 The Pax Earth team arrived at Shree Seti Devi Primary School located at Khardarpati village at 12:00pm. Upon arrival, Principal Ram Lala Thakur and teachers cordially welcomed each member of Pax Earth team with red tika and flower garland. The students were waiting Pax Earth team quite excitedly as it was the first time that any organisation appeared in the school with some programs. 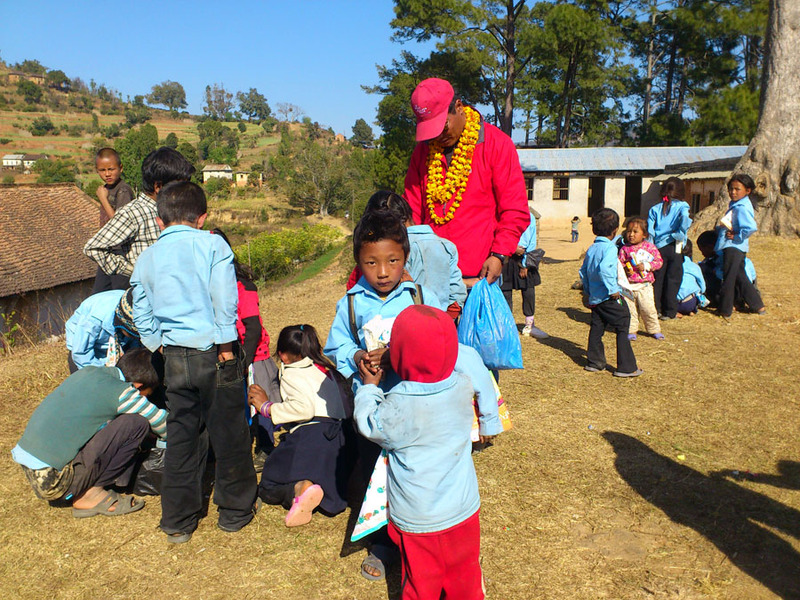 Without any formality and delay, as per the instruction of distribution coordinator for the school Sujan Koirala six distribution sub-teams started distributing useful hygienic materials (toothbrush, toothpaste, soap and hanky) to the students of respective classes (playgroup to class five) at the school premises in the presence of a few parents. The class teacher facilitated each sub-team in the distribution. Out of 109, 104 students were present on the occasion. The team handed over the hygienic materials of the five absent students to the Principal. A small addressing ceremony was observed after the distribution in which Secretary Binod P. Mainali gave a brief introduction of Pax Earth. The Chairman of school management committee extended a vote of thanks to Pax Earth for the noble and commendable effort. During the formal addresses, the team handed a spiral pad and a few ball point pens to the teachers of the school. The team also handed a few reading materials donated by Ratna Pustak Bhandar, Kathmandu to the Principal. After the addresses, a few group snaps were taken with the students and the teachers. After the formal address, the Pax Earth team headed to Shree Kalika Primary School leaving the environmental workshop team at the school. 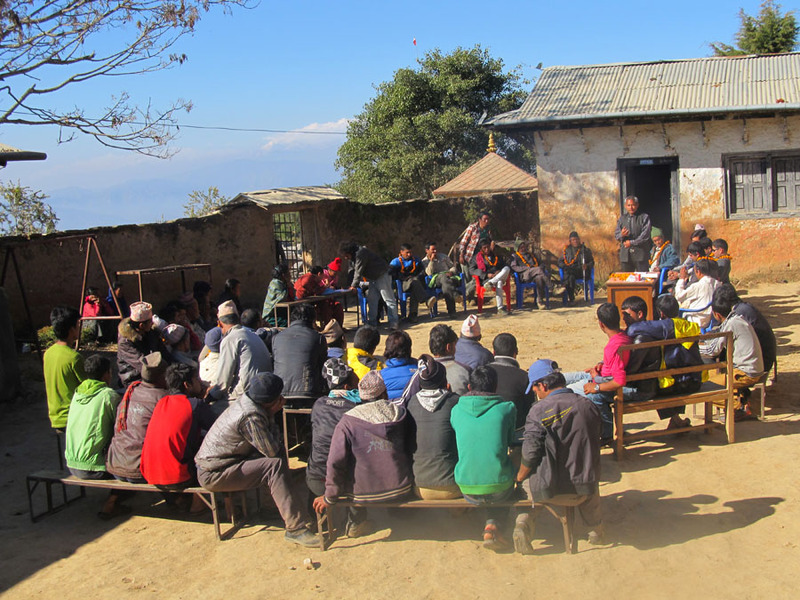 The environmental workshop team headed by President Koirala (coordinator of the environment workshop), Secretary Mainali, Kapil Koirala and Akira Sahukhal conducted a small environmental workshop on garbage management. The Pax Earth team had a field visit to this school on September 4, 2013 and discovered that the school has a poor sanitation and poor personal hygiene which urgently need to tackle through an environmental workshop. The Pax Earth involved 40 students of class 2 to 5 and 3 teachers in the workshop. The remaining students, teachers and parents observed it. These students were divided into five teams and asked to collect the garbage around the school premises. The students collected more than 10kg of garbage from the school premises. The workshop team basically taught the students and the teachers how to manage the garbage. The collected garbage was separated into degradable and non-degradable and managed properly. However, the Pax Earth team kept the plastic items in a slack to bring back to Kathmandu for the management as there was no facility for managing it. Special Guests Rabindra Man Joshi, Ngima Dorji Sherpa and Upendra Badal facilitated the workshop team in conducting the workshop. Thanks to the courtesy of well-wisher Akira Sahukhal, the team could also make the students learn the right way of washing hands using soap and water. He demonstrated the step of washing hands using water and soap; and a few students practiced it. The workshop team handed over a half dozen dustbins and dustpans to the Principal Thakur. More than 100 students, 5 teachers and a few parents highly benefited with the workshop. They learned the importance of cleanliness and hygiene in human life. The Pax Earth team arrived at Shree Kalika Primary School located at the neighbouring Kalikasthan village at 1:30pm. Principal Ram Lal Shrestha and teacher Sujata Koirala warmly welcomed each member with flower garland and khadda. 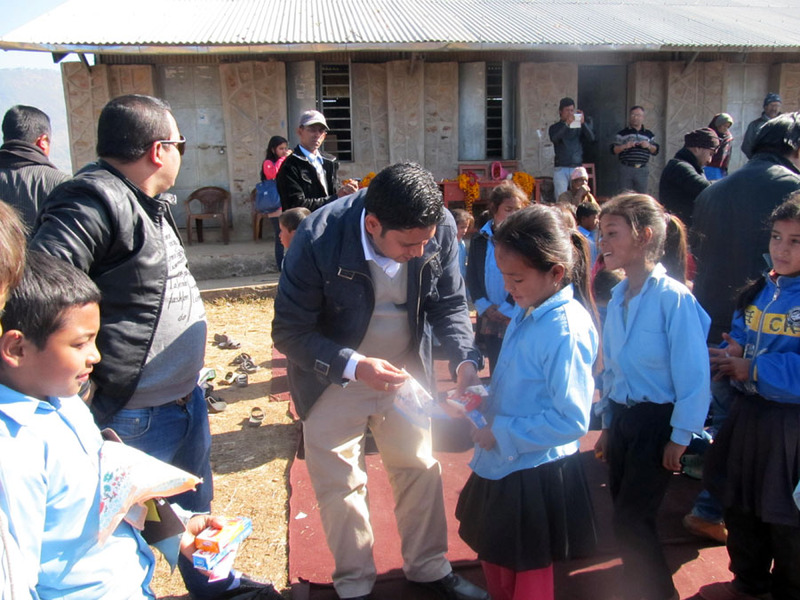 The team interacted with the students for a while and without observing any formality, the three distribution sub-teams distributed useful educational materials (notebooks, pencils, erasers and sharpeners) to the students of each class (from class one to class three) in their respective classrooms as per the instruction of distribution in-charge Bal Gopal Shrestha. Out of 25, 21 students were present on the occasion. These distributed items are sufficient for next four months. The team distributed a spiral pad and a few ball point pens to the two teachers so as to encourage them to pay more attention on students’ education. In addition, the team handed over a few reading materials donated by Ratna Pustak Bhandar, Kathmandu to the Principal Ram Lal Shrestha. The team handed over the educational materials of the four absent students to the Principal. The team headed for Shree Raktakali Primary School, Kot Timal after a few group snaps and receiving farewell from the students and the teachers. 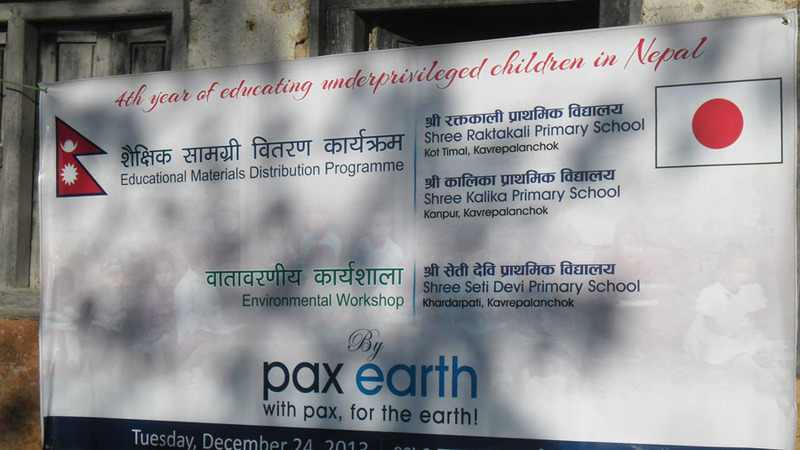 The Pax Earth team arrived at Shree Raktakali Primary School located at the neighbouring Kot Timal village at 3:00pm. Principal Hira Kaji Tamang warmly welcomed each member with flower garland and khadda. The team managed to interact with the students for a while and without observing any formality, the three distribution sub-teams started distributing useful educational materials (notebooks, pencils, ball point pens, erasers and sharpeners) to the students of each class (from playgroup to class five) in their respective classrooms as per the instruction of distribution in-charge Binod P. Mainali. The class teachers facilitated the distribute sub-team members in carrying out the distribution. Out of 80, 72 students were present on the occasion. These distributed items are sufficient for next four months. The team distributed a spiral pad and a few ball point pens to the six teachers with a view to encourage them to pay more attention on students’ education. In addition, the team handed over some useful reading materials donated by Ratna Pustak Bhandar, Kathmandu to the library. The team handed over the educational materials of the 8 absent students to the Principal. A few members of school management committee and parents were present at the distribution. Shree Raktakali Primary School honored Pax Earth with a letter of appreciation highly valuing the financial support extended to school building renovation, adding more than 50 books in their library and continuously contributing in educating the poor and needy children for the past four years. A small honouring ceremony was organised after the distribution of the educational materials. On behalf of the school, Principal Hira Kaji Tamang handed the letter of appreciation to President Sujan Koirala and entire team joined him in receiving it. Delighted President extended a vote of thanks for the recognition and promised to continue the support in future as far as possible. The school served Pax Earth members with teas and snacks (beaten rice, curry and yogurt) at a local tea shop. The distribution team left for Kathmandu at 6:30pm. The distribution team managed to stop at the home of Secretary Mainali to say hello to his parents. They managed to have dinner at Dhulikhel for the dinner. Accomplishing the mission of the day, the distribution team arrived at the hometown at 10:30pm. The driver left each member at his/her home station. The village gathering coordination team (comprised of President Koirala, Secretary Mainali, Executive Member Pahari and Honorary Member Koirala) stayed in the village for surveying deep water projects and organising a villagers gathering the next day. The team stayed at Secretary Mainali’s home overnight. On December 25 at 8:30 morning, the Pax Earth team headed to explore deep water projects located in Chapakhori and Mechchhe villages. The first deep water project was located at Kuruwas, Chapakhori VDC, Kavre (some 8km upward from Kot Timal). The villagers from Ward No. 3 to 7 have been benefiting from this project. Then, the team headed for the next water project. The next deep water project was located at Mechchhe (some 14km upward from Kot Timal). The villagers of Ward No. 4 are benefiting with this project. The whole Timal region had been facing a huge scarcity of water creating a great difficulty in the daily lives of the villagers. If the situation would not have been addressed with the project intervention, the villagers would have already migrated to other villages. 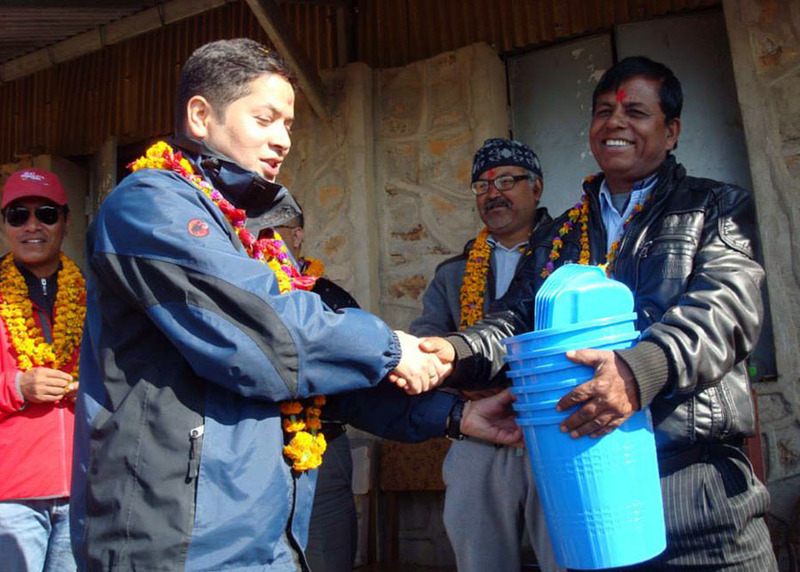 Both the deep water project was conducted under the name Timal Drinking Water (Deep Boring) Project with the financial assistance of Rotary Club of Kavre-Banepa, Rural Drinking Water and Sanitation Program, Villagers Participation Oriented Program, and Village Development Committee. Rotary Club of Kavre – Banepa received the USD 145,000.00 grant from Rotary International Foundation for implementing deep water boring projects in Timal region. From this fund, they sponsored boring, pump and installation for the Timal Drinking Water (Deep Boring) Project. The team could interact with Mohan Kumar Shrestha a warden of the project in Mechchhe and collect a few key information of the project. In the evening, the Pax team managed to review all the tasks carried out during the visit. The team stayed at Secretary Mainali’s home overnight. 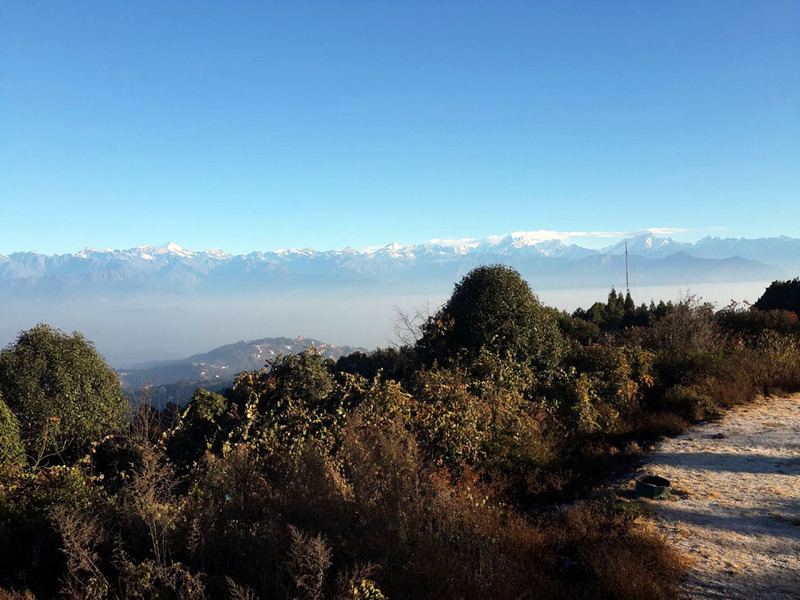 On December 26, the Pax Earth team left for Kathmandu in the morning. Accomplishing the remaining key tasks (conducting the villagers gathering and exploring the deep water boring projects); the (village gathering coordination) team arrived at Kathmandu at 2:00pm. It is quite encouraging for Pax Earth to continue supporting in the education of the needy children of remote villages of Kavrepalanchok under “Mission Education & Environment” since June 2010. 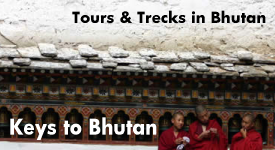 We are happy to add one more school and 110 more students in this mission. The Pax Earth is quite satisfied with the way the project has brought smiles on the faces of more than 215 poor and deprived students. Moreover, Pax Earth has been contributing in girls education as half of the beneficiaries are underprivileged girls. The villagers gathering has clearly uncovered that the “scarcity of water” is the main hindrance of the development in the Kot Timal village. As such, Pax Earth should strive to pour its effort in bringing the water in the village and stop the villagers from possible future migration. Pax Earth would like to thank Special Guests Rabindra Man Joshi, Ngima Dorji Sherpa and Upendra Badal and Guests Rajani Poudyal, Niranjan Acharya and Lava Dhakal for their valuable time and active and enthusiastic involvement in the distribution despite their quite busy schedules. We are equally indebted to Well-wishers Akira Sahukhal, Suraj Acharya, Dina Nath Ray and Rupa Mainali for their support in carrying out the distribution and workshop. Pax Earth is thankful to Ratna Pustak Bhandar for donating some useful books for these three schools. Coordinator and members of environment workshop committee; distribution in-charges and members of distribution sub-teams, and members of villagers gathering committee deserve a sincere appreciation. Pax Earth expresses a sincere gratitude to the principals and the teachers of three schools for their cooperation in successfully carrying out the distributions. Pax Earth is also grateful to the villagers for their active participation in the villagers gathering. Pax Earth extends a sincere gratitude to parents and family members of Secretary Binod P. Mainali for serving delicious foods for the Pax Earth members during their stay. Pax Earth must thank the driving team for offering a comfortable travel despite the rough and tough road. Last but not the least; Pax Earth would thank all members who directly and indirectly contributed in implementing all the tasks successfully.